PETALING JAYA: SP Setia Bhd posted a 22% rise in net profit to RM38.2mil for the first quarter ended Jan 31 against RM31.2mil in the previous corresponding period. In a statement to Bursa Malaysia yesterday, it said the higher net profit was mainly derived from property development activities carried out in the Klang Valley, Johor Baru and Penang. The group’s construction and wood-based manufacturing activities also contributed to the improved earnings. Revenue was RM363.9mil for the quarter against RM297mil a year ago while earnings per share stood at 3.76 sen against 3.07 sen previously. An analyst told StarBiz the results were below expectations but he believed the current quarter would probably see a better performance as the company’s new property sales were strong. SP Setia said having achieved its highest first-quarter sales of RM608mil, it had decided to increase its sales target for the year ending Oct 31 (FY10) by 25% to RM2bil. It also said the group targeted to continue strengthening its core landed residential earnings base through sales of existing and new product launches. SP Setia Bhd, Malaysia’s biggest property developer, fell to a one-month low after the company was downgraded at RHB Research Institute Sdn Bhd, which said the share price is in line with the market return. The stock dropped 4.1 per cent to RM3.98 at 4:10 pm local time in Kuala Lumpur, set for its lowest close since February 22. The company had its stock rating cut to “market perform” from “outperform,” RHB said in a report today. SP SETIA Bhd's wholly-owned unit Setia Promenade Sdn Bhd has terminated a joint-venture agreement with PPH Resorts (Penang) Sdn Bhd and is suing to recover money incurred in the development of a 45-acre freehold land in Penang Island. In its filing to the stock exchange yesterday, SP Setia said the Court had fixed a date in June 2010 for case management of Setia Promenade’s action against PPH. The agreement was first announced on December 12 2006. Since then, Setia Promenade said it had spent RM12.2 million on the project. It had recently filed a writ of summons and statement of claim to PPH. KENANGA Research has initiated coverage on IJM Land Bhd with a "buy" call due to its promising growth prospects, geographically diversified strategic landbank with large gross development value (GDV) and positive news flow from headline projects among other reasons. 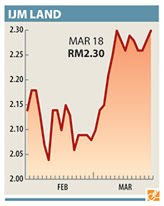 Its target price for IJM Land's share price is RM2.79, a 22 per cent upside from its current share price, the report by Kenanga said. "IJM Land owns one of the largest landbanks with an estimated RM25 billion GDV in Malaysia. A promising future lies ahead for the company given two large pipeline projects - 'The Light' and 'Sebana Cove'," it said. The report also indicated that the company's current net gearing of 0.25 times is healthy compared with the sector range of 0.2-0.4 times. MALAYSIAN builder Sunway Holdings expects record profits in fiscal 2010 as the government quickens the roll-out of public sector contracts and as the company’s overseas orderbook swells, said a top executive. Sunway, ranked seventh among local builders with a market value of US$268 million, will tender for new jobs worth up to RM16 billion (US$4.84 billion) globally with its construction orderbook expected to grow by one-third to RM4 billion this year, said managing director Yau Kok Seng. “Market conditions have improved over the last six months and we are confident of securing some projects that we have tendered locally,” Yau, a chartered accountant by training, said in an interview today. Malaysia, home to Asia’s largest budget carrier AirAsia, is planning a new low-cost carrier terminal (LCCT) that will cost RM2 billion to build. Sunway shares were up 2.72 per cent at the close of the early trading session today. The stock has risen 16 per cent so far this year, outpacing the construction sector index’s gain of 4.6 per cent. The earnings forecasts by seven analysts surveyed by Thomson Reuters I/B/E/S put Sunway’s 2010 net profit at RM120.54 million and revenue at RM2.11 billion. Previous year comparisons were not available as Sunway changed its financial year-end to December last year.